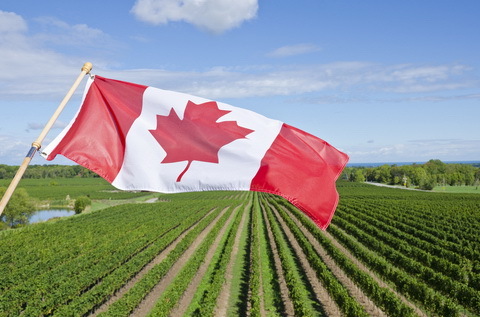 What better way to celebrate Canada Day than with wines that are truly our own? Choice isn’t a problem with 500 wineries producing 350 million bottles annually. However, it’s the quality of Canadian wines, rather than the quantity, will convince you that they are the ideal complement to summer fare. Although many Ontario and British Columbia wines are available nationally, those from smaller producers may only be available in their home provinces. This makes them a special treat worth sampling if you encounter them during your summer travels. Here are my top Canadian wine reviews to add to your custom shopping wine list, along with the winners of The Great Canadian Wine Match. Take The Great Canadian Wine Quiz to test your vinous savvy, and join us on CBC radio’s drive-home shows today to chat about Canadian wines for Canada Day. 1. There are 500 grape-based wineries in Canada and 1,700 grape growers and 27,500 acres of vineyards. 2. The Canadian wine industry contributes $6.8 billion to the Canadian economy, including $1.2 billion in tourism and 31,000 jobs in manufacturing, agriculture, tourism, transportation, research, restaurants and retail. 3. Every bottle of wine made in Canada contributes $31 to the domestic economy versus approximately 65 cents for an imported foreign wine. 4. Dollar sales of Canadian wines have jumped almost 50 percent over the past five years, while imports went up by only half as much. 5. Canadians drink more than 1 billion glasses of Canadian wine every year, or 220 million bottles. But that’s only 30% of total wine consumption in the country, with foreign imports accounting for 70%, led by France, Italy and the US. Lots of room to grow. 6. Six provinces make grape-based wines: British Columbia (212 wineries), Ontario, Quebec, Nova Scotia, New Brunswick and Prince Edward Island. 7. Alberta, Saskatchewan, Manitoba and Newfoundland make fruit-based wines. Although the classic vinifera grapes such as pinot noir, riesling and chardonnay don’t grow in these provinces due to their climates, fruit such as blueberries, cloudberries, lingoberries, and partridge berries, are the basis for making wine. These wines exhibit a fresh berry character with bright acidity, making them great accompaniments to lobster dinners and other fish dishes. 8. In addition to the classical varieties, Canada grows several unique hybrids such as Baco Noir, Seyval Blanc, Marechal Foch, a cross between Pinot Noir and Gamay grapes, and Vidal, often used as the basis for its world renowned icewine. 9. Canada’s cool climatic conditions enable it to be the largest icewine producer in the world. The grapes for icewine must be gathered and pressed at a temperature not higher than –8oC. Although both Germany and Austria are large icewine producers, their climates are not as consistently cold as is Canada’s to guarantee icewine production every year. Canada produces over 2 million 375ml bottles of icewine annually. The average price of $45/bottle in Canada will go as high as $220 in Japan. 10. Cool climates such as Canada’s produce grapes that are naturally higher in a chemical compound resveratrol. Resveratrol is the anti-oxidant in grape skins that protects the fruit against fungus attacks, and when consumed in wine, appears to reduce fat and cholesterol in human blood which contribute to heart disease. Sources: Canadian Vintners Association, BC Wine Council, Wine Country Ontario, Association of Quebec Vignerons and Winery Association of Nova Scotia.